Railpictures.ca - Stephen C. Host Photo: 650 feet is the height of the Niagara Escarpment at Vinemount, Ontario and four 645′s are groaning in protest as train 640 has nearly finished the climb. At 650 feet high one can see many things in the background – Lake Ontario for one – in front of the Lake is Stoney Creek, and in the background Burlington and Oakville, Ontario. The suggested photos below will show many TH&B and CP photographs from other great photographers over the years. | Railpictures.ca – Canadian Railway Photography – photographie ferroviaire Canadienne. 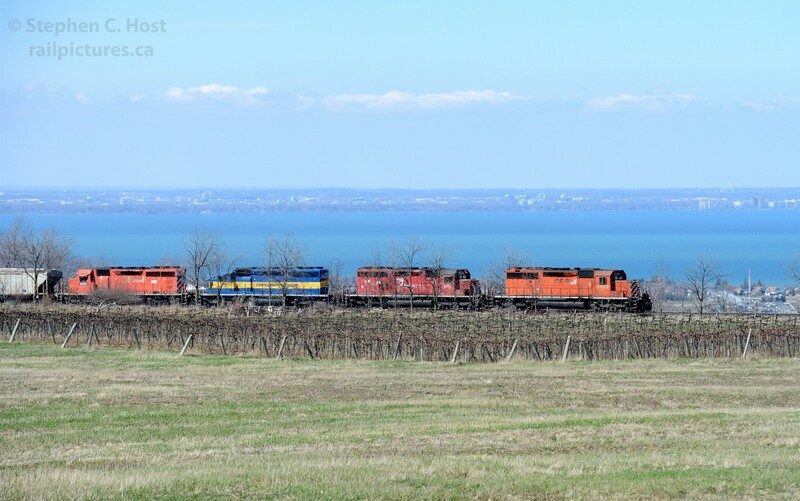 Caption: 650 feet is the height of the Niagara Escarpment at Vinemount, Ontario and four 645's are groaning in protest as train 640 has nearly finished the climb. At 650 feet high one can see many things in the background - Lake Ontario for one - in front of the Lake is Stoney Creek, and in the background Burlington and Oakville, Ontario. The suggested photos below will show many TH&B and CP photographs from other great photographers over the years.